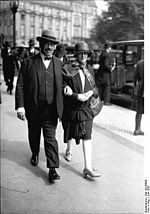 After becoming a leading journalist for the SPD he participated in the November Revolution in Germany and was Finance Minister of Germany in 1923 and from 1928 to 1929. His most famous work was Das Finanzkapital (Finance capital) one of the most influential and original contributions to Marxist economics with substantial influence on Marxist writers such as Vladimir Lenin influencing his writings on imperialism. He was the first to put forward the theory of organized capitalism.